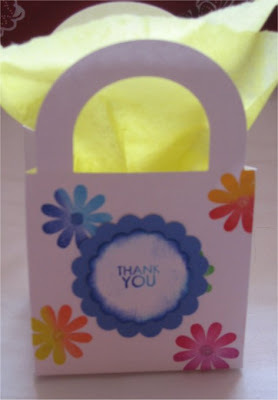 Ok, I was at the Dollar Store and found a package of 12 of these little box/bags in the wedding section. They were flat so you had to assemble them......well I bought TONS of them and last night I played around with one and look how dang cute it is!! Since there was 12 of them in a package and the package cost $1 that makes them about 8 cents a piece. WOWZER!!! What a great find!! I don't make great finds like that very often but, dang, this one was AWESOME!!! 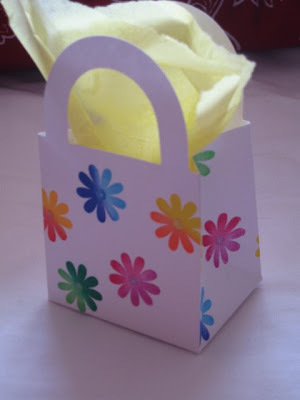 There are so many things you can do with these little bags. I love that the bags are white so that you can use any stamp with any color ink and not worry that it won't show up. Anyways...what do you think?